There are several approaches to this, and I haven't looked at which is most efficient. But I'll demonstrate a conceptually simple approach that would work to get you started. For each vertex on a face, define the vertex coordinates according to "azimuth" and "elevation" from the patch's center. For example - in a right-handed coordinate system, for a patch that faces the Z+ orientation, your "azimuth rotation" vector would be Y+, and "elevation rotation" vector would be X+. A patch's vertices will range from -45 degrees to +45 degrees in both azimuth and elevation. So to simplify the example, lets say your patch is 91x91 vertices. The central column of vertices will have an azimuth of 0 degrees, and the central row of vertices will have an elevation of 0 degrees. Each subsequent column of vertices from the center of the patch towards its X+ side will increase in azimuthal value by 1 degree, ranging from 1 to 45 degrees. Similarly, each subsequent row of vertices from the center of the patch towards its Y+ side will increase in its elevation value by 1 degree, also ranging from 1 to 45 degrees. The opposite holds true for the negative quadrants (-1 to -45 degrees). Once you've calculated all vertex normals in the "Flattened" patch-space, rotate each normal value twice: once around the 'azimuth rotation' axis by its azimutal value, and then around its 'elevation rotation' axis by its elevation value. So a vertex having azimuth of 25* and elevation of 30* would be rotated around the Y+ axis by 25 degrees, then rotated around the X+ axis by 30*. The end result is that each normal will be oriented so that its "pure upward" direction is the same as that vertex's radial vector. These two rotations can be concatenated into a single rotation matrix to make the calculation more efficient. Again - this isn't the only approach, but it's a starting point. Hope it helps! On another note: I've been away from this project for awhile now, mostly because my professional work has ramped up to a fever pitch over the past several months. It looks to be that way until this Summer, unfortunately. Although at that point I'm getting out of the Navy and taking a few years off to pursue various other projects and passions. I definitely have fun with this kind of stuff so will undoubtedly return to it in the future. But I may be inactive in the thread during the short term. Hey I need to ask this mainly for my own sanity - Does anyone here working on full scale procedural planet tech have the intention to either open source or Sell the procedural planet tech on the asset store that they have been working on? I've thought about doing so - but it would not happen until this Fall. Right now it's just a passion project. The code isn't exactly open source, but most if the 'inner secrets' are discussed pretty openly in this thread. The devil is in the details, course. but most if the 'inner secrets' are discussed pretty openly in this thread. The devil is in the details, course. After completing the code for asteroids via GPU I've put my project partially on hold due to the performance bottlenecks between CPU and GPU as adressed earlier. Currently I watch the Unity3D beta program and roadmap to see where it goes to and if there come new additions which might be handy. E.g. I really hope that they extend their MaterialPropertyBlock as already adressed by NavyFish. As they adress a lot of GPU related topics in their current betas and on the roadmap up to 5.4 (e.g. DX12 support) estimated for june, I keep my fingers crossed that there is some interesting stuff in it. For example I am going to evaluatue next in their current beta if GPU instancing can help me to draw a lot of asteroids at once. So summing it up, I am currently not about extending the current code further, but research and prototype what comes with the beta's. EDIT: In the meantime I started a thread in the forum what to do about the light / render issue that occurs with Unity later than 5.2.4 in the way a few of us do (NavyFish, me, etc.) to create meshes (overexposed / pixelated and not considered by directional light). Hopefully we find out, I'll post it here in case it impacts others as well. As an update to the render issues I had with versions after 5.2.4, it was related to the RenderTexture-Format. Unity seems to have changed the default bevahiour when working with those, so take care what you do when using RenderTextures that you explicitely define the right format. I've been further looking into the latest 5.4 beta (5.4b18) and the MaterialPropertyBlock. Unity included SetBuffer() to the MaterialPropertyBlock in that beta branch. So the good news is, you can now pass your ComputeBuffer results via MaterialPropertyBlock to your renderer, which I and a few others (NavyFish) did to pass ComputeShader results (terrain heigth values) via ComputeBuffer to the Vertex Shader (to replace the vertices there). And I can confirm that this works as intended. However the bad news is, it will still break batching. Even when using a single mesh instance and a single material instance. Each time you change the MaterialPropertyBlock by doing a new SetTexture() or SetBuffer() call, batching will be prevented. So this alone won't help to increase performance for those who have chosen a similar design to create terrain in Unity on the GPU. Unity also added "GPU instancing" into the 5.4 beta branch, but looking into the current documentation and dicussion in the beta forums, different MaterialPropertyBlocks will prevent instancing on GPU too at the current stage of implementation. It will be of help to render lots of similar objects which werent batched before, which can be of use in our scenario to render suns (or maybe small repetitive asteroids/rocks). I did a quick brute force test where I created ~25.000 spherical meshes (without LOD or anything) which weren't batched before. The GPU Instancing feature worked out of the box here. So the good news is it looks like Unity's 5.4 branch will invent a new feature for those who want to create not only planets but more some kind of universe where you draw repetitive but lots of objects. However, I am afraid when drawing a detailed terrain surface where you need different appearances per plane by use of the ComputeShader, there won't be any new options in terms of performance gain. I have some new experience with Unity 5.4b18 last week, but my planetary engine crashes the driver on quad generation/dispatching, so i rolled back. I think that it is Unity's bug, cuz no crashes on build. Anyway i tested instancing too - 10k cubes without lod etc. ~ the same results to you. BTW, @JoergZdarsky, in your demonstration videos i can't see any "render stall" when new quads generated. What is your dispatching mechanism? At the moment i use WaitForEndOfFrame (several) to "smooth" the "render stall" on dispatching. Ho do you do the magic? No need for WaitForEndOfFrame or anything, I simply dispatch everything to the GPU for calculation and directly render it afterwards in my shader. Do you read back anything to the CPU? After that i call ComputeShader.Dispatch(...) for all threads that i need. In the end, in rendering queue, i use Graphics.DrawMesh(...), and pass in to it default prototype mesh (simple flat quad mesh) with output ComputeBuffer that contains position data for each vertex. 5) If generation parameters was changed - restart from p.1. Without WaitForEndOfFrame(several times eg. 8 or 4) i have Gfx.WaitForPresent up to 100-300ms. I think i lost something and i need to draw mesh directly from the GPU? Like Graphics.DrawProcedural? Thats basically the way most of us do it (at least NavyFish and me also). No idea where these stalls come from, except that you may have the same problem with the number of draw calls per frame. Or some other kind of overhead or flaw in your code (e.g. too many computeshader dispatches per frame, bad computeshader thread sizing, or something in the computeshader itself.....). Or maybe hardware. I dont know. Here I dont have any stalls (GTX 570), except that the number of draw calls remain a problem, as stated before. 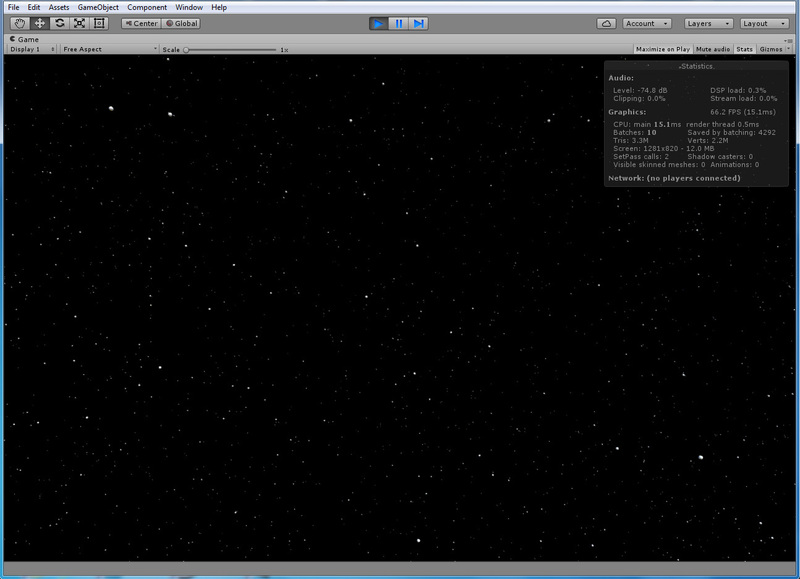 A little bit further brute force testing of Unity3Ds GPU instancing. 10.000 asteroids within a little more dense volumetric fog, all rotating around the origin and the fixed camera. No care for triangle count or anything. Unity 5.4 finally has been released a few days ago. I am curious to see if others are trying out some of the new additions that now went into their final as well? Works with MeshRenderers that use the same material and the same mesh. Only needs a few changes to your shader to enable it for instancing. Supports custom vertex/fragment shader and surface shaders. Compared to current dual-thread rendering (main thread + rendering thread), this splits up rendering logic into concurrent "graphics jobs" that run on all available CPU cores. If you create a larger group of different asteroids procedurally at the initial startup and then performance friendly in the background during gameplay, and render asteroids out of this group instead of calculating them completely individual on demand, GPU instancing could help a lot nonetheless. I think this is the way Limit Theory did this too. 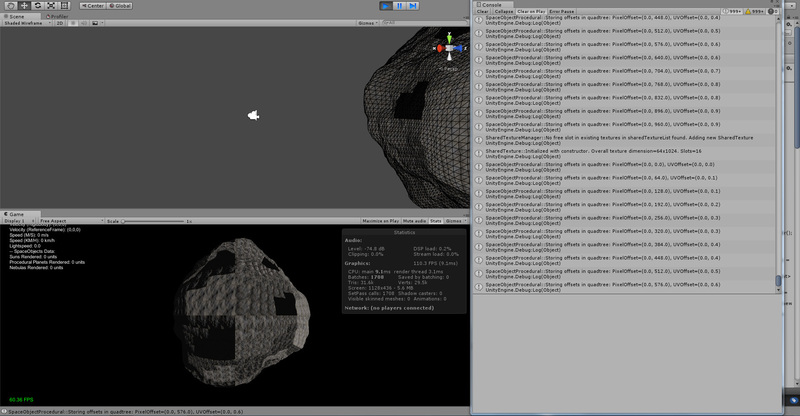 Thats why I currently try to make my head around what would be the best mesh strategy for asteroid using GPU instancing. Icospheres, being a single mesh and gameobject, would probably the best and GPU friendliest. You instance only once per LOD, and it forms for lower lods a nice unique sphere. However a large downside IMHO is the quickly increasing number of vertices during the splitting iterations. Maybe this is not a problem when instancing, but IMHO gives you less flexibility on refining the LOD (and limits the number of vertice detail at the highest LOD to something Unity3D can handle in a single mesh). The other idea would be to keep going with quadspheres, which would be much more flexible. But as long you want to use GPU Instancing you'd have to instance at least six meshes for a single asteroid until you combines the meshes to one mesh. Are others here looking into the new Unity 5.4 version as well to share experiences? I have not revisited this project in some time, but that planet rendering itch is starting to bother me again, so I'm very thankful you've been keeping up with the latest unity advancements and reporting on them. Will save me and others a lot of trial and error! Point is, I will soon have a lot of free time, and, while there are many ways to fill it that I currently have planned, this is a project I will likely revisit sooner than later. I intend to work on the gpu -> cpu readback stalls. Likely this will require me to build a native plugin to utilize asynchronous buffer transfers. I think it can be done. Have you considered contacting the unity development regarding SetBuffer breaking batches? I was under the impression that batching was the whole point of material property blocks, so it's possible that that's a bug. In closing, again thanks for the great updates. I look forward to doing a little more active work on this project in the near future. glad you are back and that you are doing well! Sounds like a big turning point in your live, wish you all the best for that and that you enjoy that new part of your life a lot! Well thanks, however I wouldn't be overoptimistic with the new Unity3D version 5.4. There seem to be some very interesting features in it pretty usable for various usecases for universe stuff, but for some of the planetary surface issues we faced here I have doubts that there is something revolutionary new in. But I still have to look into some of the details to figure out how to use this or that best. I've not been putting too much time into this yet, as continouing on a beta version can be a bit anoying. Now as 5.4 went into the final version, I've recently upgraded to 5.4 with my latest project, which is now a third iteration of the prototype I am building from scratch (well, still utilizing lots of the techniques and classes previous built, but I felt it is time to do that to structure the creation of space objects more efficiently). And besides that writing a few blog articles/tutorials so that the next one does not have to go through some of the same pains. I look really forward to rebuilt some of the parts, e.g. the handling of scales and management of multiple objects when it comes to LOD, and make some things more natural (better denser asteroid fields, or placing planets more realistally around sun). We'll see. And, as the new 5.4 features are stable, it now makes sense to use them too. That would be a huge step forward!! For us here on the forum for our specific procedural planet usecase of course, but I have seen many requests on the Unity3D forum as well. Being able to get GPU data back to CPU would allow to implement many features we are currently blocked. I you find your time and manage to do this, a lot of people would owe you something thats for sure. Well... I fear that we mght have overrated the MaterialPropertyBlocks a bit. My current impression is, looking what blocks the batching, that MPBs are more meant for a more elegant way to pass the same material properties (textures, buffers, floats, etc) to different objects at once instead to set each one seperately. I hope I am wrong, but that is how it looks to me. I've been in contact with one of the developers (zeroyao) describing our very specific problem that different buffers break batching. This has been the response. Currently textures and computebuffers can't be instanced automatically. buffer and use instanced properties for location as mentioned above. Hmmm. Sounds reasonable and could work. As you see from his comment, not only the buffers are a problem to batching, different materials such as textures are as well. Anyway maybe there is an opportunity in his suggestion. I have a raw layout of a dynamic management/pooling of multiple shared textures and buffers in my head which I plan to refine and implement in the next couple of weeks. In any case I recommend to have a read on this thread. Its an interesting discussion of users (and Unity members) reporting about GPU instancing and the batching behavior. Same here, looking forward to some interesting and fun discussions! EDIT: I finished implementing a "shared RenderTexture" management/pooling. Right now on request of a new RenderTexture, a slot of a configurable larger texture (basically an atlas) is being provided including indivual UV coordinates. If all slots of a shared texture are used a new one is being created in the background. Including house-keeping (use the next free slot and release shared textures again if not used). The dimensions (or number of slots) of the shared textures in the background are configurable in width and height. E.g. in case you use 256x256 textures for normalmaps, those are being stored for example on a 1024x8192 texture in the background, which means it offers 128 slots. I combined the shared texture strategy to the procedural generation (our CS/GPU approach) in Unity3D. I am testing this with asteroid rendering currently. According to the debug log the request of new shared texture slots and the background management of these shared textures works, also the pixel- and UVOffset values per slot look good. Also the surface shader now only uses a part of the texture (e.g. 64x64, the height and width of each slots texture) instead of using the full shared texture (e.g. 64x1024). So far so good. Last remaining change is to consider the offset values in the ComputeShader and SurfaceShader. In the picture you see that I am currently write (in the CS) and read (in the SS) only into the first slot as the texture repeats per all planes using the same shared texture instance (I currently only constantly use offset (0,0) for testing purposes). Thus that is the expected result at the moment. As soon as I include the offset values passed to the ComputeShader and SurfaceShader things should look good. Then 16384 planes could share the same texture in 64x64 resolution or 4096 planes in 128x128 resolution. That part should be finished in the next couple of days, then I can move over to do the same for ComputeBuffer. 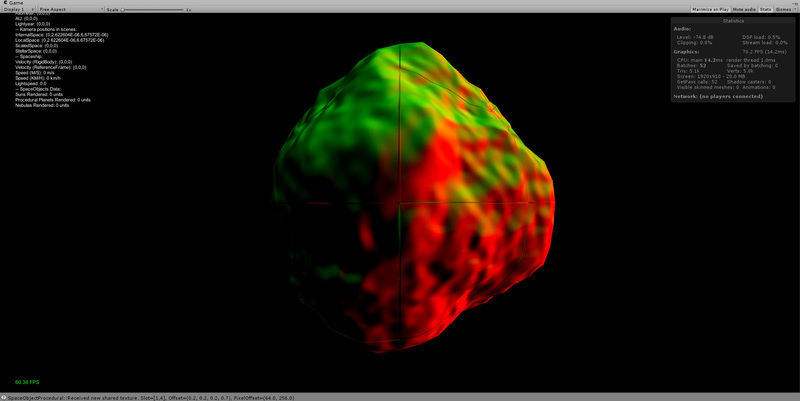 If things work well, the current asteroid should be rendered in one batch instead of thousands. Wow, great progress! This is a cool technique indeed, reminds me almost of John Carmack's 'supertexture' technique. Assuming it works for you, I definitely will incorporate the same approach into my project once I get going again. Thanks for the update! There is some progress with the shared RenderTextures. 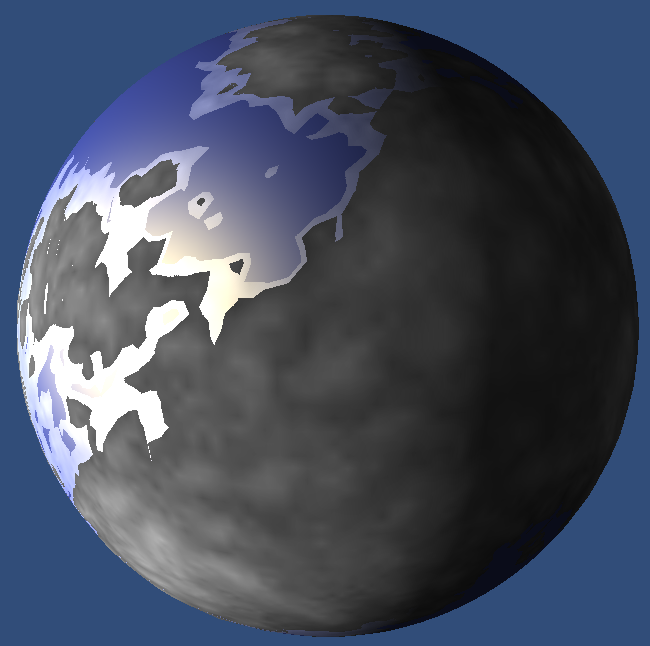 I added the offset values to the ComputeShader and SurfaceShader as planed. It basically worked immediately but nevertheless, I had a bad time the last few days because there was one annoying bug. At the moment a quadtree node was splitted, sudden black texturing appread on other planes. Guessing there was a bug with the offset calulcation in the SharedTexturesManager class, I was investigation there first. In the end the issue was quite simple. I had one RenderTexture.Release() command in my quadtree code left that was called at the point a quadtree node is splitted. Of course this may not be done when working with a shared RenderTextures that functions as an atlas. The one and only class that may finally release the Texture is the SharedTextureManager that validates if a texture is used anymore or not. Works like a charm now, I am pretty happy with the SharedTexture implementation. Quite flexible by defining the number of slots in both directions width and height, and the background housekeeping removes textures if not used in order so safe memory. Only thing I now need to get under control before moving on to do the same with ComputeBuffers is the bleeding that now happens due to the atlas. I haven't yet dealed with the problem in detail, need to check if padding within the shared RenderTexture is the solution or if I should handle this problem somewhere else (e.g. 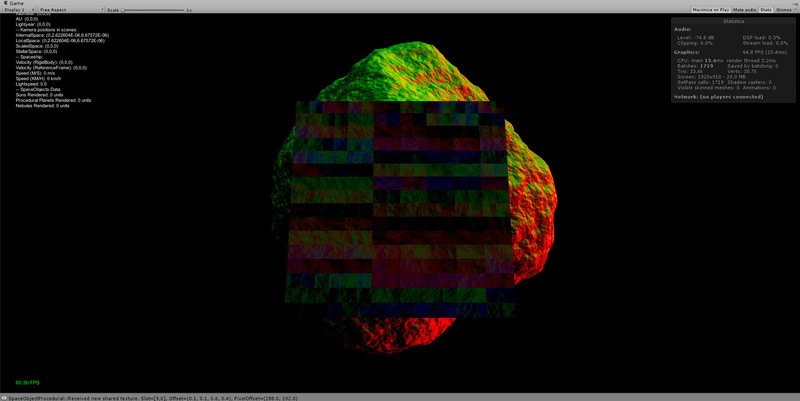 modifing the UVOffset calculation in the SharedTexture class or later in the SurfaceShader slightly). Any suggestion very welcome! EDIT: Simple half pixel correction while calulcating UVOffset and tile scale did the trick. Time to move on to create a shared ComputeBuffer now. While implementing the slot strategy for ComputeBuffers I am currently investigating on how to create slots for the buffer and read from them or the right offset in the vertex shader. I am currently stuck at how the vertex shader has to be changed. Question is how to change the vertex shader to read here from the right offset of the computebuffer too.. I wonder, especially as the shared RenderTexture approach now works nicely, if I might move onto storing the results of the ComputeShader in a texture instead of a ComputeBuffer to pass the height information etc. from there to the Vertex-/SurfaceShader? While ComputeBuffers are still fine to pass parameters to the ComputeShader, storing its result (height-information and position information) might be not necessary or a texture would do the same work? Are there reasons against using RWTexture to store heightmap etc. in a texture instead of a buffer and do a lookup in the vertex shader? I'd then create two textures, one that holds the vertex position (float4) and one that holds the patchCenter (float3). I've read that ATI cards had once problems with that. I keep looking to do the slot mechanism for the computebuffer, but would like to as about the textures meanwhile. I did my own itty bitty procedural gen 5 years ago. It had issues, very incomplete, and all on the CPU. And Unity didn't do doubles back then which was screwing me. Only spent about 2 weeks on it, IIRC, as a learning exercise. All I did is learn how to procedurally cubespheres plot and manipulate a cubespheres, equally space the UV and polygons(so corners aren't pinched), rewrite a Java Simplex noise implementation to C#, and experiment with generating and blending that noise. Super basic. It sounds like you may need to pass the slot ID to the vertex shader as a constant input in order to pick from the compute buffer. Material Property Blocks should let you do so, but perhaps I misunderstood the situation. Nothing wrong with writing to a RW texture per-se, especially since your data is inherently 4x4-byte aligned. Compute buffers are a bit more flexible when it comes to the data types they store but in this case you don't need that flexibility. I would still profile both methods to make sure there isn't some huge performance difference. Nice work with the shared text you! I will have to consider implementing this method myself.